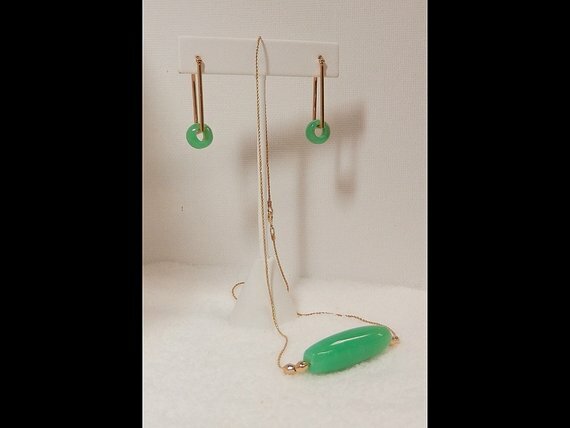 Australian Chrysoprase Marlborough Mine Old Stock Gem Chrysoprase Designer Jewelry Suite in 14k Yellow Gold. 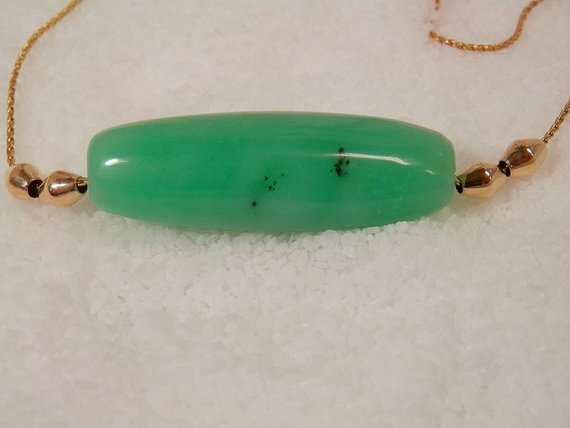 This bright apple green Marlborough Chrysoprase is amazing. Still takes my breath away....I love this stone! 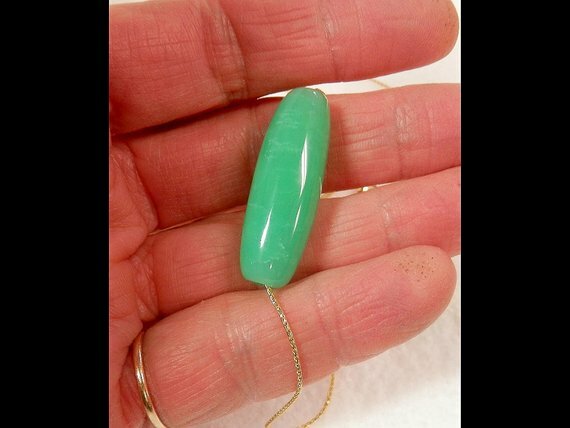 This gem-grade translucent focal bead of some of our old stock Australian Chrysoprase is fantastic and this large eye candy bi-cone on the 18” 14k yellow gold wheat chain is spectacular in it's simplicity. This gem chrys is hard to find any more, only a few of us still have any of this quality rough. Ken did a wonderful job on the focal bead and small beads for the earrings. The elongated rectangle 14k yellow gold earrings have an architectural flair and measure 12mm x 28.6mm. 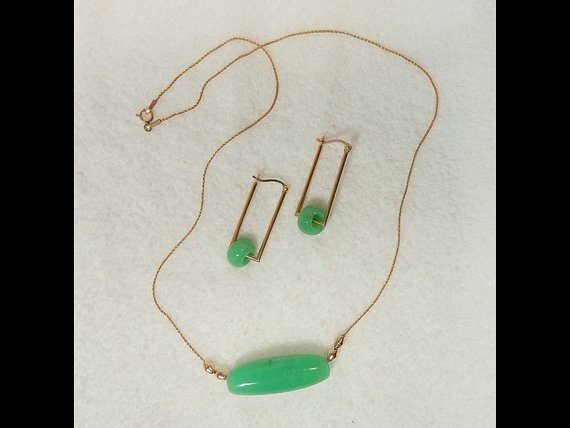 This is a truly wonderful gem suite of jewelry. 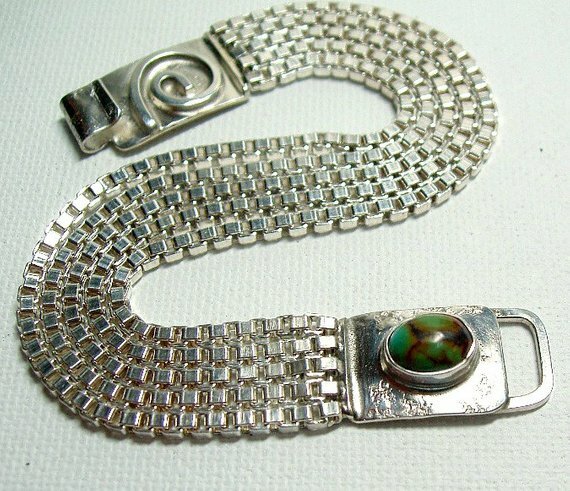 This spectacular designer bead measures 35mmx 12mm and weighs 36.70 cts. The earring beads weigh approx 4.5cts each and measure 6.8mm x 10.5mm each. Thank you for looking and as always, buy with confidence!